Keira Knightley Is Honored as One of 'Harper's Bazaar' UK's Women of the Year! Keira Knightley is a beauty in blue while walking the red carpet at the 2018 Harper’s Bazaar Women of the Year Awards on Tuesday (October 30) at The Ballroom of Claridges in London, England. The two-time Oscar-nominated actress was one of the magazine’s honorees! Also in attendance at the event were Ellie Bamber, Downton Abbey‘s Laura Carmichael, models Adwoa Aboah and Arizona Muse, and actors Dominic West and Peter Capaldi. FYI: Keira is wearing a Givenchy dress. Adwoa is wearing a Mary Katrantzou dress. Arizona is wearing a Michael Kors dress. Ellie is wearing a Chanel outfit. Jodie Whittaker Makes 'Doctor Who' Debut in 2017 Christmas Special! Jodie Whittaker made her debut as the next doctor on tonight’s Doctor Who Christmas Special, which also saw the departure of Peter Capaldi. 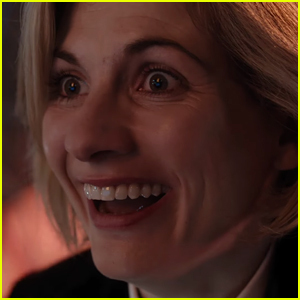 Right when Jodie appears on screen, a crisis occurs and something major happens… which won’t be continued until the start of the next season. Watch the video below and tune in for Twice Upon a Time at 9/8c on BBC America. 'Paddington 2' Releases Full Trailer - Watch Now! Paddington 2 just got a full trailer, which you can watch right here! 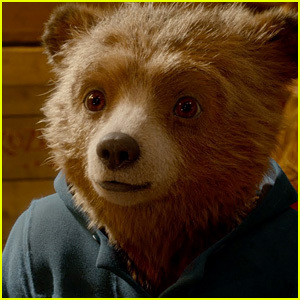 The upcoming Paddington sequel, which hits theaters on January 12, 2018, co-stars Hugh Bonneville, Sally Hawkins, Brendan Gleeson, Julie Walters, Jim Broadbent, Peter Capaldi, Hugh Grant and Ben Whishaw as the voice of Paddington, as well as Madeleine Harris, Samuel Joslin and Imelda Staunton. Here’s a plot summary: while searching for the perfect present for his beloved Aunt Lucy’s hundredth birthday, Paddington sees a unique pop-up book in Mr. Gruber’s antique shop, and embarks upon a series of odd jobs to buy it. But when the book is stolen, it’s up to Paddington and the Browns to unmask the thief. The film was again directed by Paul King, and was shot in and around central London. 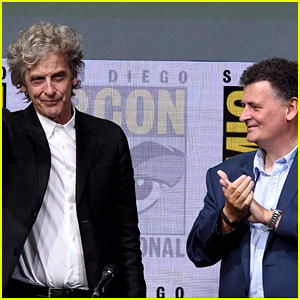 Peter Capaldi appears on stage with Doctor Who showrunner Steven Moffat at the BBC America panel during 2017 Comic-Con on Sunday afternoon (July 23) in San Diego, Calif. The guys were joined at the panel by Peter‘s co-stars Pearl Mackie and Matt Lucas. Steven responded to the backlash surrounding the casting of a woman, actress Jodie Whittaker, to be the next doctor. Angela Sarafyan, Nathalie Emmanuel & Tessa Thompson Keep the Party Going at EW's Comic-Con Bash! The 2017 Entertainment Weekly Comic-Con Party was packed with celebs last night! Westworld‘s Angela Sarafyan, Game of Thrones‘ Nathalie Emmanuel, and Thor: Ragnarok‘s Tessa Thompson were just some of the stars in attendance at the party, held at Float at Hard Rock Hotel San Diego on Saturday (July 22) in San Diego, Calif.
Also in attendance at the party were Westworld‘s James Marsden, Thor: Ragnarok‘s Karl Urban, Star Trek: Discovery‘s Sonequa Martin-Green, The Gifted‘ Jamie Chung and Stephen Moyer, The Orville‘s Seth MacFarlane and Halston Sage, actor Zachary Levi, Once Upon a Time‘s Lana Parrilla, Colin O’Donoghue, and Dania Ramirez, Black Panther‘s Chadwick Boseman, Sharknado‘s Cassie Scerbo and Tara Reid, Supergirl‘s Odette Annable, The Magicians‘ Olivia Taylor Dudley, Game of Thrones‘ Iwan Rheon and John Bradley-West, Power Rangers‘ Dacre Montgomery, American Gods‘ Ricky Whittle and Orlando Jones, Stranger Things‘ David Harbour, Spider-Man: Homecoming‘s Tony Revolori, Doctor Who‘s Peter Capaldi, Gotham‘s Cory Michael Smith, Robin Lord Taylor, and Camren Bicondova, Midnight Texas‘ Arielle Kebbel, Jason Lewis, Sarah Ramos, and Francois Arnaud, The Last Ship‘s Bridget Regan, comedian Ana Gasteyer, Planet of the Apes‘ Andy Serkis, Lucifer‘s Tricia Helfer and Aimee Garcia, SNL‘s Aidy Bryant, Dirk Gently’s Holistic Detective Agency‘s Hannah Marks, former Hawaii Five-0 star Grace Park, Prison Break: Resurrection‘s Sarah Wayne Callies, as well as David Arquette, and Lydia Hearst and Chris Hardwick. 'Doctor Who' Season 10 Trailer Is Here - Watch Now! The full trailer for the upcoming 10th season of Doctor Who has been released! 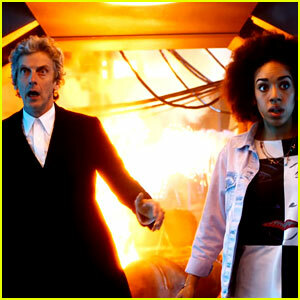 This will be the final season for Peter Capaldi and also the first season for his new companion, Pearl Mackie. The new season will premiere on Saturday, April 15 at 9/8c on BBC America. “This is the gateway to everything that ever was or ever can be. This is Doctor Who Season 10,” the network teased in the caption for the trailer. The Doctor Who spin-off series Class will debut in the U.S. right after the season 10 premiere.